Pro Stocker Tanner Gray is moving to NASCAR because, he said, the NHRA does not have opportunities for young drivers. CONCORD, N.C. – Tanner Gray has enjoyed success in the NHRA’s Pro Stock class ever since he entered it last year, but the 18-year-old competitor believes his future is in NASCAR because it provides more opportunities for young drivers. “They (NASCAR) do a better job of marketing their sport,” Gray said Friday during the Carolina Nationals at zMAX Dragway. “In my opinion, they just do a better job all-around of giving younger kids and younger talent better opportunities to succeed. It’s definitely going to be bittersweet leaving drag racing, more so because of the relationships I’ve developed with the guys that work on the car. I’ve been around them since I was eight, nine years old. That will be tough, (but) I feel like I have to do what is best for me. Next year Gray steps away from his family’s drag racing operation to join DGR-Crosley, which just won the NASCAR K&N East Series championship with Tyler Ankrum. Even though Gray will no longer be racing with his family, he doesn’t see that as an issue or an adjustment. Gray said the one thing he really liked about David Gilliland’s stock car racing operation was how hard the crew worked to make sure the driver was comfortable in the car. “They want to make sure that anything you need, you have it,” Gray said. 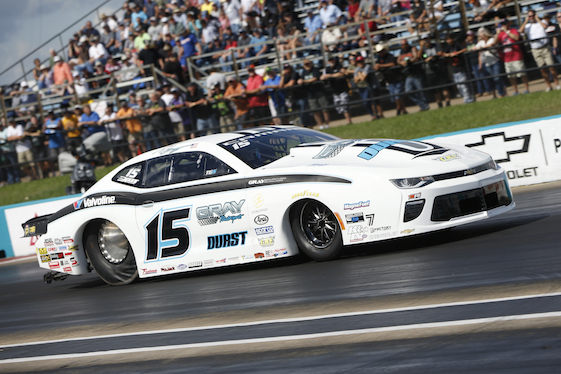 For now though, Gray is focused on winning the NHRA Pro Stock championship. He entered the Carolina Nationals with an 89-point lead over Vincent Nobile and 12 career victories. “This is kinda what I expected to do last year,” the third-generation driver said about leading the Pro Stock standings. “I think this is what we should be doing with the caliber of guys we have over there and the equipment that we have. A lot of racing anymore is the people and the equipment you have behind you. If you have good equipment and good people behind you and you’re not performing, then it’s not good. Gray began racing a Junior Dragster at age 8, but decided two years later to test his skill in other motorsports because the Junior Dragster “kinda got boring for me.” At age 10, he turned to dirt bikes and then moved into a mini sprint three years later because his family felt it was safer. He also has raced Outlaw Karts at Millbridge Speedway in Salisbury, N.C., and tested 360 Sprint Cars and Midgets. He transitioned from dirt to asphalt for the same reason he’s moving to NASCAR next year: Better for his career. In 2016, Gray joined Mooresville, N.C.-based LFR Development Group to drive a super late model. “There were good people around me, but it was a newer deal and it never really got going the way it needed to,” Gray said. When that relationship ended, Gray turned to his family’s drag racing operation for 2017 since his father, Shane, was ending his driving career. However, Gray is getting another opportunity and he’s grabbing it with gusto.